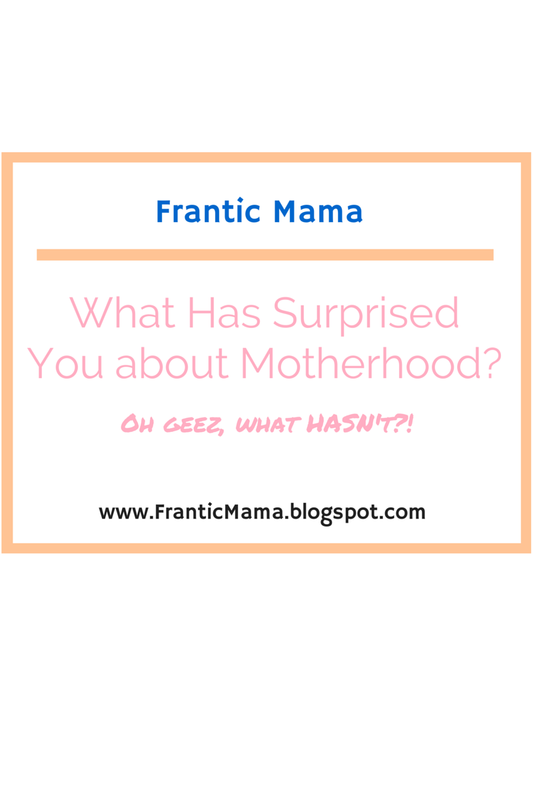 Frantic Mama: What Has Surprised you about Motherhood? Just after I had my son (my first child), and he was two weeks old, a friend came by to visit us. She did not have children yet, and she cheerfully asked me, "what has surprised you the most about motherhood?" I couldn't think straight, immersed in that sleep-deprived newborn trance, and I certainly couldn't tell her the full truth anyway. All I could sputter out was that "I sure am more tired than I expected!," followed by a good-natured chuckle. The question is so huge. Impossible, really. It cannot be answered in the one glib sentence I felt was expected of me, the Proud New Mommy. Who was I to be a Debbie Downer? I wasn't going to rattle off about the impossibly huge weight of responsibility that having a child instantly creates. I also wasn't going to confess how long the days and nights felt with a newborn, and how isolating it was. I didn't go into detail about what it feels like to nurse a baby around the clock when you have never done it before, or what it was like to do all of this while struggling to recover from childbirth. We rarely tell anyone the surprising challenges of new motherhood before they have children, especially pregnant women. Who wants to be the killyjoy who bursts the expecting mom's dreamy bubble? Or the ungrateful mother complaining to the woman next to her struggling with infertility? For better or worse, we rarely admit the hard stuff. Countless things are surprising when you have children. I'm sure the surprises will ever end. My son is now 4, and my daughter just turned 2. Every single day is filled with surprises-- both welcome and not so much. It is of course the welcome ones that we hope to remember, but in trying to spare the feelings of others, and shoving the hard days to the back of our consciousness, are we doing a disservice to women everywhere? Should we really not openly discuss the mixed bag of motherhood? So, now I'll ask you: What has surprised you about motherhood [so far]? You can find me on: Mamalode and Felicity Huffman's What the Flicka? Clash of the Couples, an anthology I'm in, comes out November 3rd. Like the Facebook page!